Your morning roundup for Feb. 22, the day Carmelo Anthony made orange look good again. • After weeks of speculation, and after a pre-taped Conan O'Brien Show in which he said he'd prefer a Denver omelet over New York clam chowder or New Jersey salt water taffy, Brooklyn-raised Carmelo Anthony was traded to the Knicks. This cost New York: Danilo Gallinari, Raymond Felton, Wilson Chandler, Timofey Mozgov, their first-round draft pick in 2014, second-round picks in 2012 and 2013 from Golden State, and about $3 million in cash. Out of courtesy, the kitchen sink was not included. 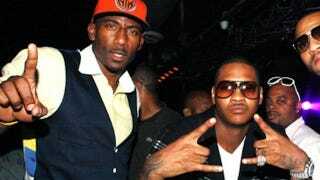 • While all this was going on, the Lakers' Ron Artest released a self-produced mixtape, "Ball'n." And then there are the shoes. • Alex Rodriguez denies that he went "ballistic" at Fox producers when they captured girlfriend Cameron Diaz feeding him popcorn at the Super Bowl. He even made a bona fide joke about it! He opened the Yankees' spring training press conference on Monday by asking, "did anyone watch the Super Bowl?" He guessed that five or six years ago he "would have come out with some bogus statement," but now (and seven pounds lighter!) he has a "sense of liberation" and is "really enjoying [life]." No one asked about his mansions. • In last night's NCAA action, No. 17 Syracuse held off No. 15 VIllanova 69-64, and No. 3 Kansas easily defeated Oklahoma State, 92-65. The Jayhawks did so without Tyshawn Taylor, who was suspended indefinitely on Monday. This monthLast season, Taylor dislocated his thumb in an "altercation" with members of the Kansas football team, and he did post "controversial" comments on his Facebook — but Bill Self hasn't said what this suspension is about. • The Pittsburgh Penguins, down 10 men including Sidney Crosby, fell to the Capitals 1-0 last night. Alex Ovechkin scored the game's lone goal in a second-period power play. • The Kings could move to Anaheim. This is apparently quite political. "[T]he Lakers aren't Orange County any more than the Dodgers are Orange County, any more than the Angels are L.A. County," explains the OC Register. So, wait. The Kings are none of the above? Good morning! Did you notice our shiny new scroll-bar?